The second-generation Echo Show is better than the first in every respect, ranging from its industrial design to its audio and video performance. 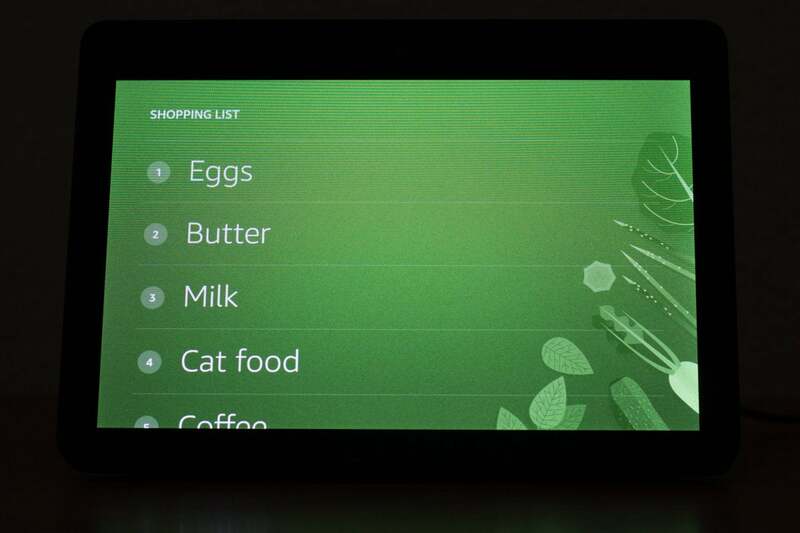 It’s the best smart display today, but that could change as soon as tomorrow if Google announces its own smart display and it turns out to be great. 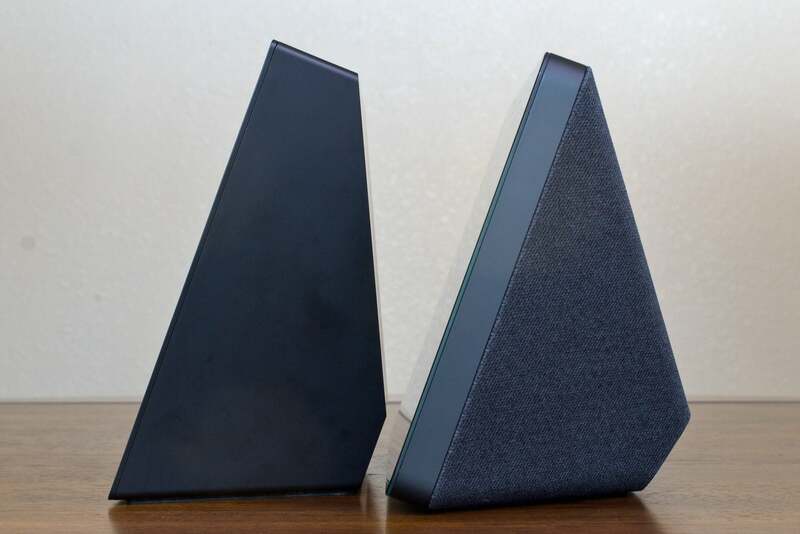 Sonos, meanwhile, still has the best smart speakers for music (the Sonos One and the Sonos Beam). While the second-generation Echo Show is powered by the same system-on-chip as the first-generation Echo Show (a quad-core Intel Atom x5-Z8350), the new model is outfitted with a larger, higher-resolution display; better loudspeakers; a more attractive enclosure; an integrated ZigBee smart home hub; and even the option for hardwired ethernet. Alexa is also becoming a better digital assistant, a development that will improve every Echo model. If you already own an Echo Show, the new model is worth upgrading to. But don’t toss the one you have! Just put it in a different room. Until you have a smart speaker or a smart display in every room—including the garage and a patio protected from the weather—you won’t have too many. The second-generation Amazon Echo Show is wrapped in attractive fabric on three sides. The new enclosure is a significant improvement over the original, which resembles a portable TV from the 1970s. The speakers have been moved from the front to the left and right sides, allowing the display to be mounted lower in its chassis. This results in the new Echo Show being slightly wider than the original, but also slightly shorter. 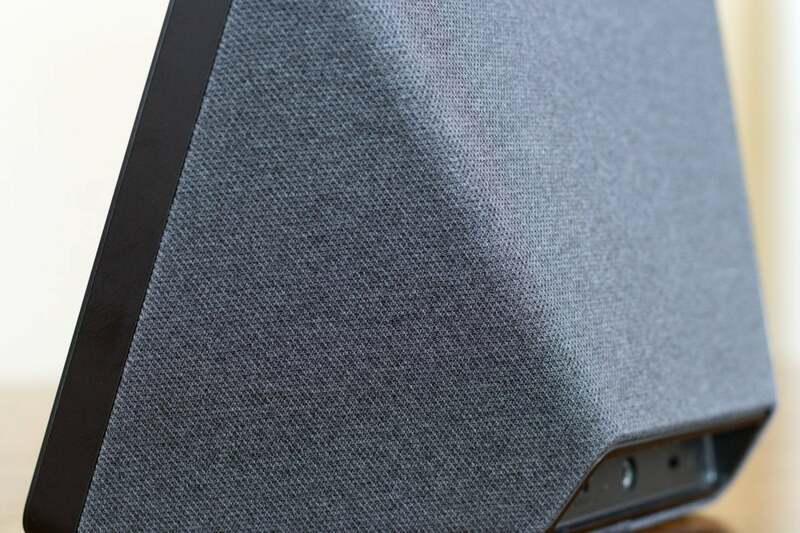 The cabinet is now wrapped in a tweed-like fabric on three sides, giving the speaker a much more elegant look. You can choose between “charcoal” (gray) or “sandstone” (off white). Four far-field mics and a front-facing camera are in the front bezel, with the remaining four mics on top. The speaker had no problem responding to the Alexa wake word even when it was playing music loudly. As with the original model, you need push only one button to mute the mics and turn off the Echo’s camera. A small LED on the button glows when muting is active, and a red bar appears across the bottom of the display. Amazon added a Kensington lock socket to the back of the new Echo Show, to the right of the connection for the AC power supply (which I’m disappointed to report is a wall wart). Four far-field mics are mounted on the top of the new Echo, and four are mounted in the top of the bezel. Amazon carried over the same 5MP camera from the original, but outfitted the second-generation Echo Show with a better lens. Most people will take advantage of the Echo Show’s onboard Wi-Fi adapter to connect it to their home network, but if your home has wired ethernet in its walls, you can plug a USB-to-ethernet adapter into its rear Micro-USB port and benefit from the reliability of that connection. The 10.1-inch, backlit LCD touchscreen (up from 7 inches on the original) offers resolution of 1280x800 pixels (up from 1024x600 pixels). Videos are displayed in 720p resolution. The new display is no brighter than the original, however, producing 450 nits. Amazon says this display enables users to stand further back from device, because unlike a tablet or a laptop, a smart display will often have an audience of more than one. Off-axis viewing is okay, but not outstanding. It’s also worth noting that the 10-inch Lenovo Smart Display delivers higher pixel density with its 1920x1200 touchscreen. The JBL Link View, meanwhile, offers the same resolution as the second-gen Echo Show, but JBL’s product also offers higher pixel density because it’s outfitted with a smaller, 8-inch touchscreen. Say, “Alexa, show Prime Originals” and you’ll get this grid view of Amazon’s original video content. Amazon has a new strategy for getting around Google’s blocking YouTube videos from showing on the Echo Show and Echo Spot, but it’s not perfect—and it currently works only on the second-generation Echo Show. When you ask for a YouTube video, Alexa will ask you to choose a default web browser—either Firefox or Amazon’s own Silk—and you can navigate to YouTube from there. But you can’t say simply “Alexa, show YouTube” or “Alexa, show Saturday Night Live on YouTube,” as you can with a Google Assistant-powered smart display (prefacing your requests with “Hey Google,” of course). Once you’ve launched the web browser (by saying “Alexa, launch Firefox”), you’ll see preset bookmarks on the screen labeled “Search with Google,” “YouTube,” and “Wikipedia.” You’ll need to tap one of those icons to navigate to that destination. Once there, you’ll need to tap a magnifying glass to initiate a search, which will bring up an onscreen keyboard with a mic icon in the middle. Tap that and then you can speak the topic you’re searching for. But you’ll need to tap the Go button to execute that search. Yes, it’s very awkward, but at least you can get to YouTube. And if—like me—you don’t care about watching YouTube videos anyway, it won’t matter a whit. As with the first-generation Echo Show, you can also use this display as an in-home video intercom system, making calls to other display-equipped Echos, and you can make video phone calls outside the home to other Echo Show or Echo Spot users, or to people who have the Alexa app installed on their mobile devices. The new Amazon Prime Video landing page attractively presents your entertainment options. You can speak or touch your choices from here. 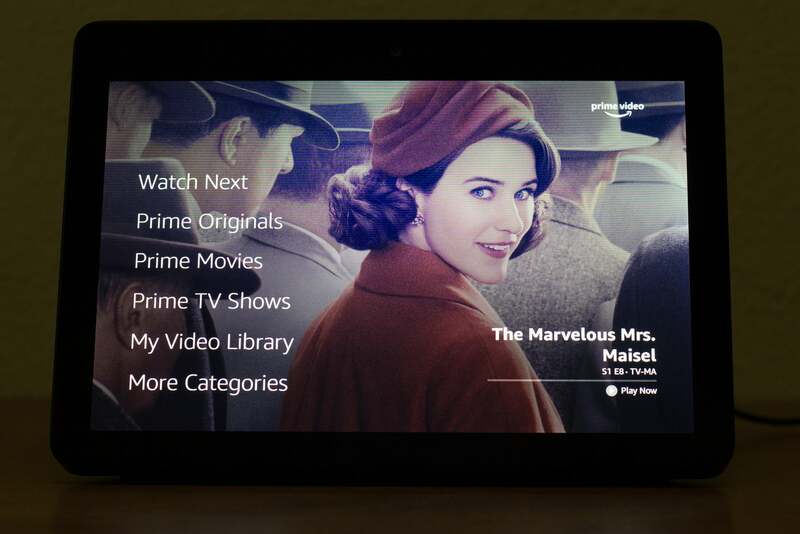 Amazon has significantly retooled its Amazon Prime Video user interface to make it much easier to browse for entertainment options—at least on that service. Say “Alexa, show Prime Video” and the Echo Show will display six options: “Watch Next,” “Prime Originals,” “Prime Movies,” “Prime TV Shows” “My Video Library,” and “More Categories.” You can speak or touch any of those items to drill down to the next level. 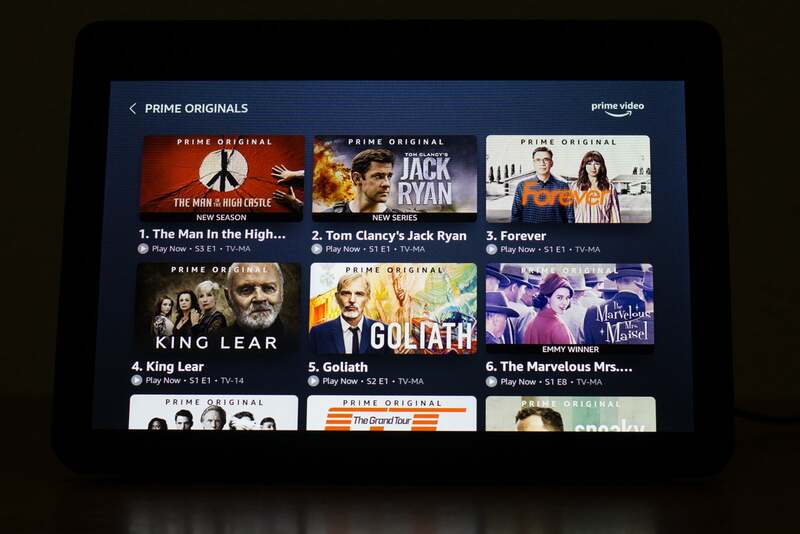 Say “Alexa, show Prime Originals,” for example, and the Echo will show a numbered grid of Amazon’s original movies and TV shows. Say “Alexa, play number 5” and the Echo will start streaming whichever video is labeled number 5 on the display. Asking Alexa to show Prime Video on the older Echo Show or on the Echo Spot results in a much less satisfying experience, one that doesn’t include those structured menus. Satellite and cable-TV subscribers will soon be able to watch on-demand video from NBC on the Echo Show (you’ll need to validate with your service provider credentials first), and Hulu subscribers will be able to watch that service’s offerings, including live TV and sports programming for those who pay for Hulu with Live TV. Another way to watch live TV on the new Echo Show will be to buy an over-the-air antenna and Amazon’s Fire TV Recast ($230 on Amazon). Integrating those two products will also allow you to record and play back recorded live TV. None of that had been activated during my pre-release evaluation period, so I can’t say how well it works, but Amazon says it will all be available when the new Echo Show goes on sale. Amazon has improved Alexa’s list-making feature. You can now speak several items at once without needing to repeat the wake word. Say “Alexa, add eggs, butter, and milk to my shopping list,” for example, and each of those items will be listed. A partnership with the music-video service Vevo allows you to use voice commands to search for music videos from your favorite artists. And as with other display-equipped Echos, lyrics scroll across the screen when you listen to music on Amazon’s own music-streaming service. This is an amenity I’d really like to see with other services, such as Spotify and Pandora. Amazon put a slightly more powerful Class D amplifier in the new Echo Show (10 watts per channel, compared to 6 watts per channel in the original). Locating the 2-inch paper cone drivers to the left and right sides of the enclosure greatly increases stereo separation, and the new 9.3-square-inch passive radiator in the back of the unit really helps with bass response. I still found the second-generation Echo Show’s audio performance slightly inferior compared to the Google Assistant-powered JBL Link View. And being outfitted with discrete woofers and tweeters, I found that the Sonos One, Sonos Beam, Apple HomePod, and Google Home Max smart speakers all deliver much better sonic performances. Amazon tapped Dolby to bring its digital processing expertise to bear, but I think it’s a bit overdone. The new Echo Show presents a sound stage that literally sounds six feet wide. Listening to Steely Dan’s “Deacon Blues” (from Aja), Donald Fagen’s vocals were properly centered, but the guitars and the rest of the backing instrumentals sounded as though they were coming out of thin air far left and right of the display. The effect was even more pronounced watching videos. In episode eight of The Marvelous Mrs. Maisel (“Thank You and Good Night”), in which Miriam and her friend/manager Susie drunkenly commiserate over Miriam’s potentially career-ending take-down of fellow comedienne Sophie Lennon, the women’s laughter sounds downright ethereal. The new Echo Show (right) has its active speakers mounted on the left and right sides of the enclosure. They were front-mounted in the original smart display. Those criticisms aside, the second-generation Echo Show is Amazon’s best-sounding smart speaker to date, and I imagine some people will like the pronounced Dolby effect. Besides, I’m sure there are also many people like me for whom music is the last thing they use smart speakers for. 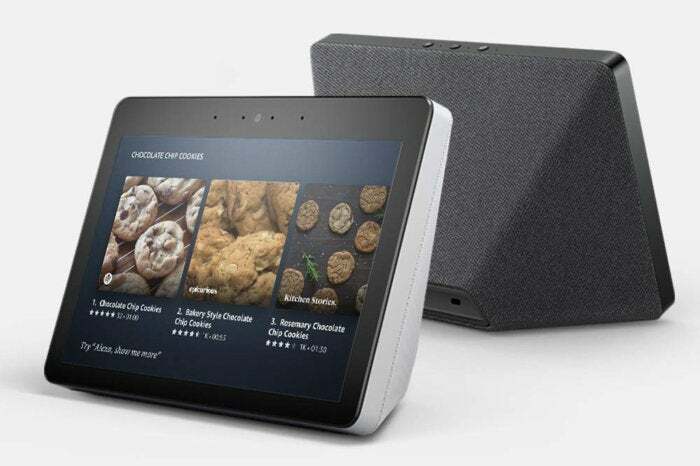 And unlike the current crop of Google Assistant-powered smart displays, the Echo Show and Echo Spot can be used in multi-room audio systems right along with other Alexa-powered speakers—including Sonos models. If you don’t already have a smart home hub, the new Echo Show has a ZigBee smart home controller onboard. That enables you to control any of the growing universe of ZigBee-powered smart home devices: Smart light bulbs, door locks, dimmer switches, plugs, thermostats, and more. 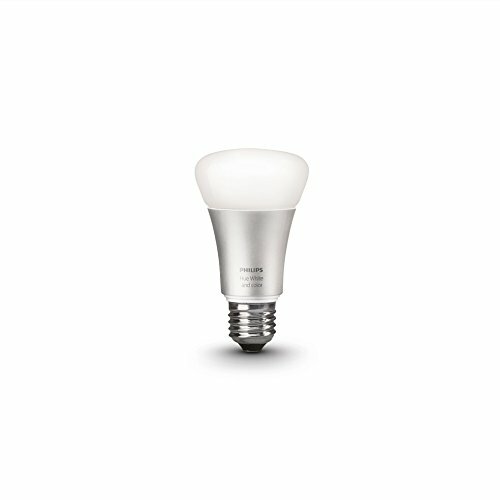 You can also control Philips Hue light bulbs—both color and white—without needing the Philips Hue Bridge. But you’ll need the Bridge anyway if you want to use the Hue app, with its color wheel; any third-party Hue apps; or any of Hue accessories (motion sensors, remote controls, and so on). The Echo Show’s new user interface provides quick touchscreen access to your smart home devices. 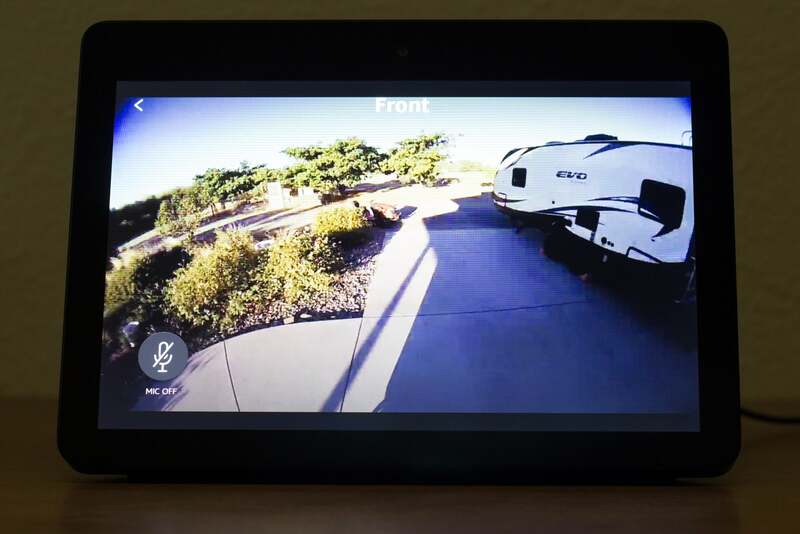 If you have a compatible home security camera or video doorbell, you can live-stream video from the camera to the Echo Show. Amazon is also adding two-way voice support for Ring video doorbells and security cameras that support that feature, so that you can have a conversation with the person in front of the camera. A Ring video doorbell will also send an alert to the Echo Show when a visitor presses its button. These new features also work with August video doorbells, and Amazon says it’s looking to expand these capabilities to other third-party products that support two-way audio. Another new feature allows you to swipe down from the top of the Echo Show’s display to reveal touchscreen controls for a subset of the smart display’s features: You can set up new alarms and see any existing alarms, control your smart lighting, set up routines and edit existing ones, access the Echo Show’s settings, adjust the display’s brightness, and toggle its do-not-disturb function. The lights function helpfully shows the most recently controlled lights at the top of the list, but you can only turn lights on and off—there’s no on-screen dimmer control here. Still, it’s a great feature to have for those times when you don’t want to use your voice. The new Echo Show now supports two-way audio when streaming video from Ring video cameras that support audio (this stream is from the Ring Floodlight Cam). Amazon’s Echo team continues to ignore Z-Wave, the other major player in the smart home space. If you have any of those devices in your home, you’ll need a third-party hub (Samsung SmartThings, Wink, Vera, etc.) or a third-party smart home service. 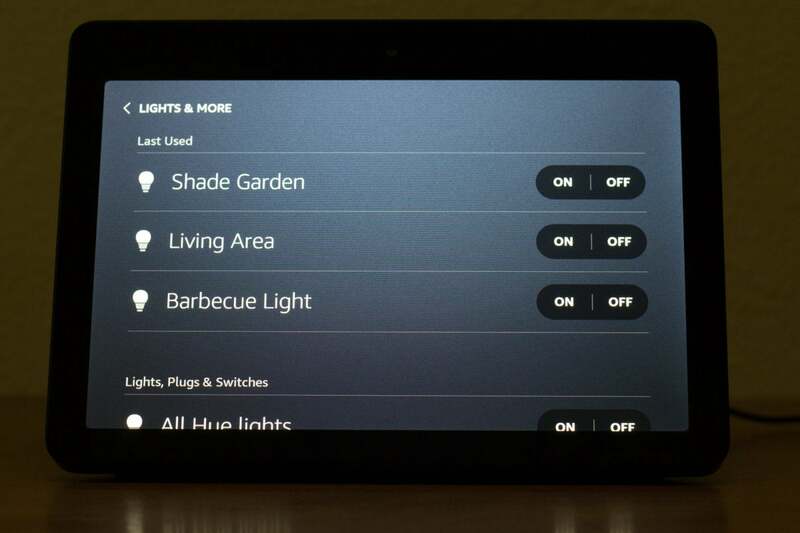 I have almost 50 Z-Wave devices in my own home and have deployed Echos in every room, so I can use voice commands to control lights, door locks, garage door-openers, and other components connected to a Vivint Smart Home system. With its second-generation Echo Show, Amazon retakes the lead in smart displays, with across-the-board improvements compared to its first-generation product, and features like an integrated smart home hub and multi-room audio support that Google doesn’t offer. The new Echo Show looks better, it sounds better, it’s more capable, and it’s easier to use than ever before. It’s not perfect, especially for people like me who are nit-picky when it comes to audio, and Google Assistant is still better when it comes to delivering generation information and being integrated with a smartphone, but Amazon is coming on strong. Correction: This story was updated to correct a factual error that a reader brought to our attention. 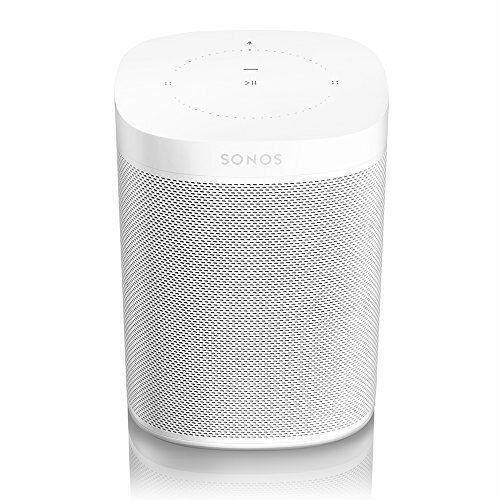 It originally reported that the Sonos One was the only two-way smart speaker. The Apple HomePod, Sonos Beam, and Google Home Max are among the smart speakers that are also outfitted with discrete woofers and tweeters.